The U.S. and Iran are back to trash talking each other mercilessly. The U.S. and Iran Are Back to Trash-Talking Each Other Mercilessly. Very Smart. 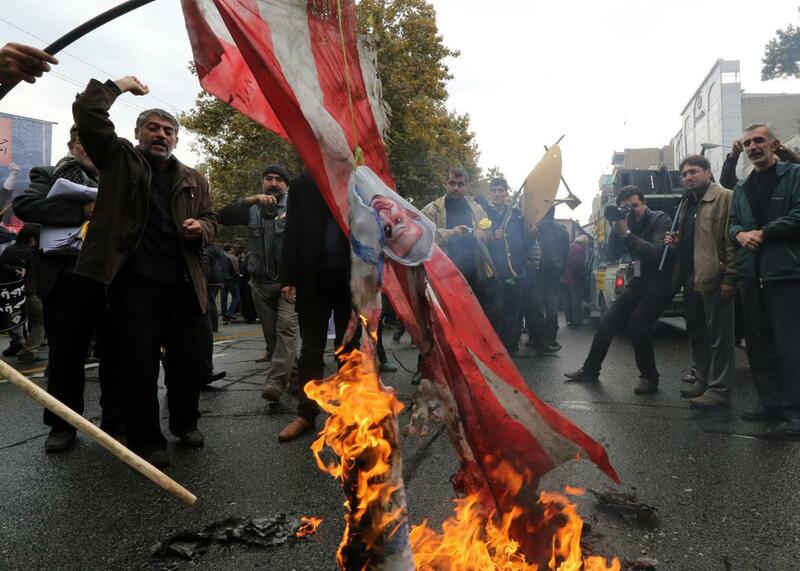 Iranians burn U.S. flags outside the former U.S. embassy in Tehran on Nov. 4, 2014, during a demonstration to mark the anniversary of its storming by student protesters. Here we are again: After the comparatively good vibes of the past couple of weeks, things have reverted to normal in the contentious U.S.-Iranian relationship. Over the weekend Secretary of State John Kerry expressed concern that Iran’s Ayatollah Ali Khamenei had declared his country still “180 degrees” opposed to U.S. policies in the Middle East. “Even after this deal, our policy towards the arrogant U.S. will not change,” the supreme leader said on Saturday, at a ceremony marking the end of Ramadan. It’s a little hard to believe that the secretary is really reaching for the smelling salts in response to the idea that Iran is still committed to pushing back U.S. influence, given that he is about to head to the Gulf for a trip that he himself says is part of an effort to push back Iranian influence in the region. And it’s not as if his boss is embracing Iran. So what’s with all the trash talking? Both governments know that the best way to sell the nuclear deal to skeptics is to diss the other side as much as possible. The U.S. and Iran are reaching out to assuage their allies, with Kerry headed to the Gulf and secretary of Defense Ash Carter headed to Israel, while Iranian President Hassan Rouhani said in a speech that the deal would not diminish Iranian support for “the people of Palestine, Yemen, Syria, Iraq, Bahrain and Lebanon.” And both governments insist that nothing has changed in their adversarial relationship except for the accomplishment of a narrow goal—the elimination of an Iranian nuclear weapons program for the U.S., the lifting of sanctions for Iran. Some in both camps likely hope that relations may soon improve more broadly. But for now, the best way to sell a risky deal with a longtime enemy is to make it clear over and over again that the other side is still the enemy.